Heat the oven to 400°F. Unfold the pastry sheets on a lightly floured surface. Spread 3 tablespoons cheese on each pastry sheet. Top each with 4 slices prosciutto. Cut each into 15 strips crosswise, making 30 in all. 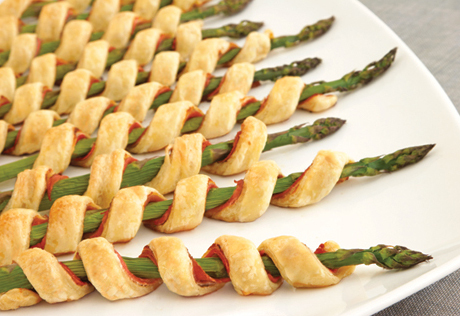 Tightly wrap 1 pastry strip around each asparagus spear, prosciutto-side in. Place the pastries seam-side down onto 2 baking sheets.